The promise of excellent skies tonight drew me out to the astronomy club observing site in the Spencer, Ohio area. When twilight finally faded the atmosphere was clear enough to allow us to see the Milky Way stretch from southern horizon to high overhead and a bit beyond! 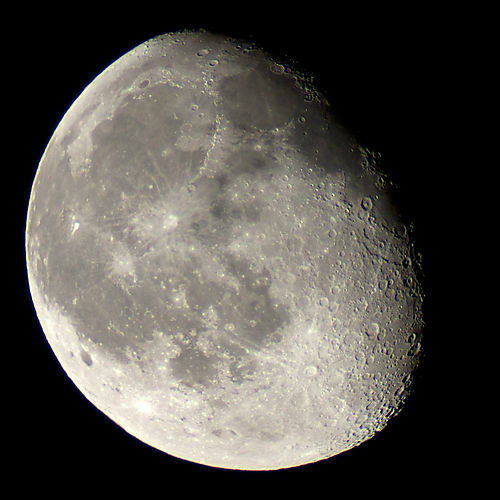 The Moon as it appeared the night of August 28, just before 11:00 PM. Though the sky was clear, it did suffer overall from light pollution or, perhaps, some lingering natural twilight. Viewing of a number of Messier objects was only fair. My old friends galaxies M81 and M82, which can be a lovely sight within the same eyepiece field of view, were barely discernible against the gray background sky. I did view, for the first time, M20 –the Trifid Nebula– but observed no nebulosity, only the associated star cluster. The “Whirlpool Galaxy” (M51) could barely be seen at all though M31 –the Andromeda Galaxy– put in an appearance looking, typically, like a cottonwood seed fluff. I love refractor telescopes but frequent issue is that, when aimed straight up, the eyepiece can be uncomfortably low to the ground. So I happily got a nice view through a companion’s SCT of the Ring Nebula (M57) which, at that hour, was high overhead. In all, I viewed: M11, M20, M22, M31, M51 (barely), M57, M81, M82, in the space of under a couple of hours. Then came the Moon. As the waning gibbous Moon rose, its glow obscured the lovely path of the Milky Way and made it increasingly difficult to see any but the brightest deep sky objects. The Moon is both loved and reviled by amateur astronomers worldwide for this reason: it’s great to look at but can spoil the view of just about everything else… that old devil! Jupiter emerged from behind the Sun earlier this year minus its dark southern equatorial cloud band or belt. I was eager to see. Though still low in the sky and rising at nearly the same altitude as the Moon, I was able to get a decent view of the planetary disk. Observed at several magnifications, with and without ND filter and sure enough, only one dark band was visible. I thought I could see hints of the Great Red Spot but, with the planet still low in the atmosphere, couldn’t confirm that. I hope to get a better view of Jove next month but, at least, I got to see it! I aimed the telescope at planet Uranus but that distant world was barely a dot in the eyepiece. My project for the night was to attach my Canon EOS 50D digital SLR camera directly to my big Meade refractor — using the 1,200mm optic as a telephoto lens. I’d never tried it before and it worked beautifully. There was some difficulty achieving sharp focus which was a surpise to me. Add to that the fact that I did not yet have a cable release for the camera and I was happy to get usable images at all. I did, however, get one very good shot out of the experiment (shown here) and will be ordering a cable release soon. That little device will help me minimize vibration — I had to trigger the shutter by pressing the shutter release button by hand; an action that shook the entire telescope and did not help picture taking. Packed up and left at about 11:15 a happy fellow. Wow – that looks awesome. There really is something magical about the moon. “I like to think that the moon is there even if I am not looking at it”, Albert Einstein said. But it is safer to have the confirmation of it once every twenty eight days !! !